The TUBE-TECH LCA2B is a two-channel unit with an independent compressor and limiter per channel. The unit is all tube based (except for the power supply and side chain circuit). The VCA (1 dual triode) is placed between the input transformer and the output stage (2 dual triodes). The audio signal is picked up after the VCA and fed to the side chain circuit. The control signal from the compressor and from the limiter is combined and sent to the link switch and to the control amp, which feeds the VCA. The two bi-directional link busses are accessible at two 1/4″ stereo jack sockets on the rear panel. The channels can be linked together for stereo applications and also linked to other LCA 2B’s via the two link busses and a standard stereo jack/jack cord. 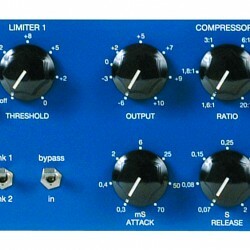 The compressor has six att/rel presets as well as manual control. The limiter att/rel is fixed. The LED display is fed from the control amp. The limiter LED is fed from the limiter buffer. The audio path is fully symmetrical from input to output. Input and output have fully floating transformers. All DC voltages are stabilized, except the anode voltage for the output stage. Turn the THRESHOLD for both compressor and limiter fully counter clock-wise. Connect a 1kHz tone at a level of 0 dBu (-4VU)* to the input and turn the LIMITER THRESHOLD slowly clock-wise until the LIM led (RED) turns slightly on. If the LCA2B needs calibration, the compressor starts pumping with this extreme setting. Create blank session in Pro Tools. Add a single track and on that track assign the “Signal Generator” plugin and assign that track to an output. Grab an XLR cable and connect it to the corresponding output previously selected in your DAW. With a DMM (digital multi-meter) capable of measuring a 1000Hz AC signal measure the voltage of pins 2 and 3 on the XLR. Adjust the level in the signal generator plugin up or down until your DMM reads 0.775VAC. Once adjusted connect the XLR to your LCA-2B and proceed with your test. Net: 6.5 kg 14.3 lbs.